"Look at all those firsts!" That's what the volunteer said to me when she handed me the blue ribbons at the Antelope Valley Fair. We won firsts for our Golden Supreme & Royal Gala apples & Shinko Asian pears. We also won second prize for Rosi Red Bartlett pears & 20th Century Asian pears. 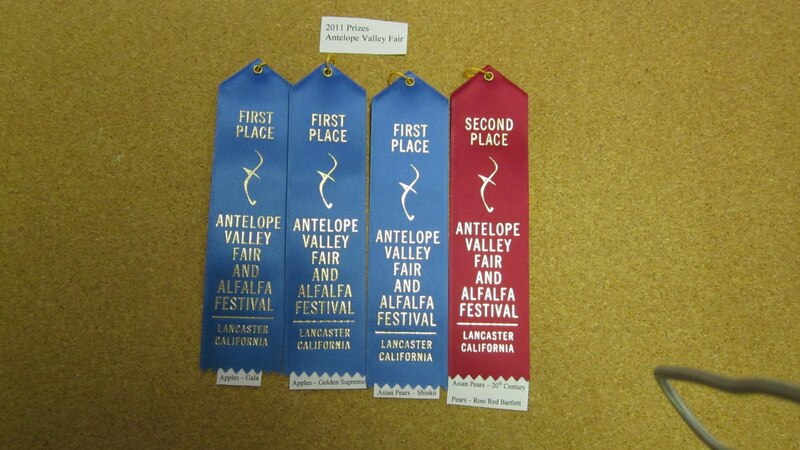 Yes, that's right, we won both first & second place in the Asian pear category. Yeah for us. It's a great boost in an otherwise disappointing fruit year. We finally opened for u-pick business this weekend. It was a long wait since we lost all the crops for the first half of the season. I really missed having people drive in, all excited to pick fruit straight from the trees. The little kids are the best - they think it's so interesting. Most people buy much more than they anticipated. We even had our first picnickers this weekend. So great to get back into the groove. Sky King likes it too. He's picking his apple off the tree. And lots of petting for a friendly dog.